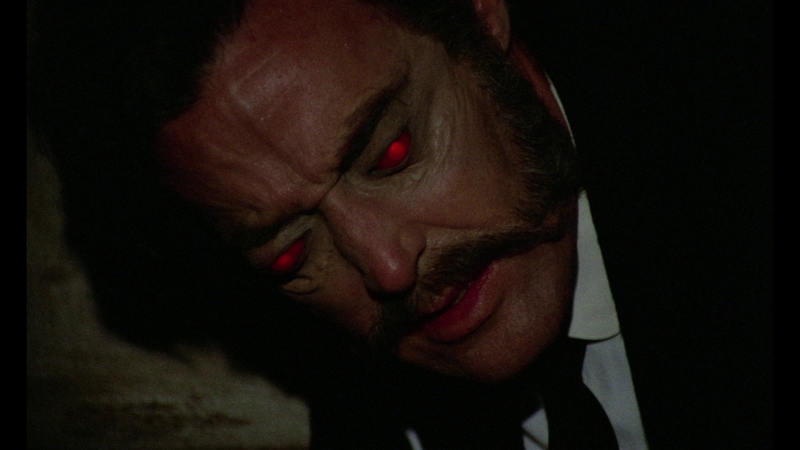 Tracing the history of Horror Express, it’s clear why this jumble of genres ended up as it did. 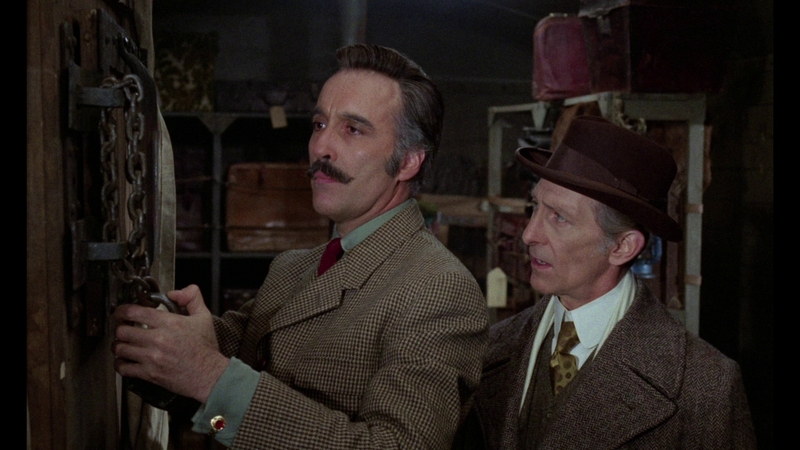 Horror Express was filmed in Spain by a Spanish director, written by two native New Yorkers, produced by a blacklisted Communist, starred two Europeans, while being set in both China and Siberia. 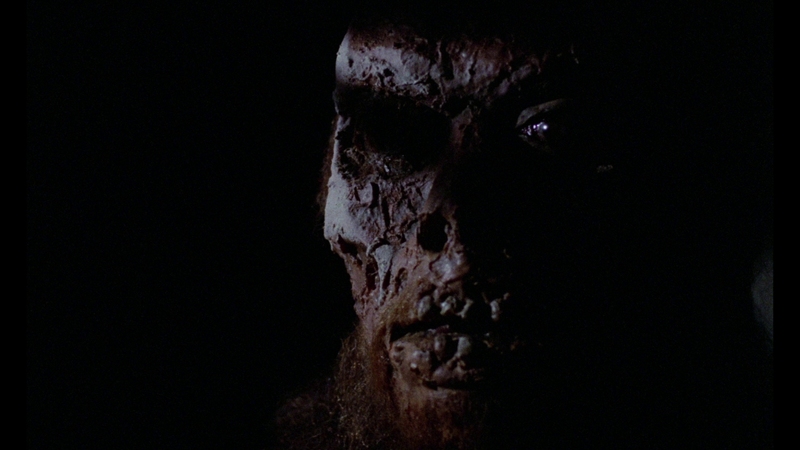 This isn’t a complaint, but rather context for the exotic and unsteady near-masterpiece of this early ‘70s freakshow. 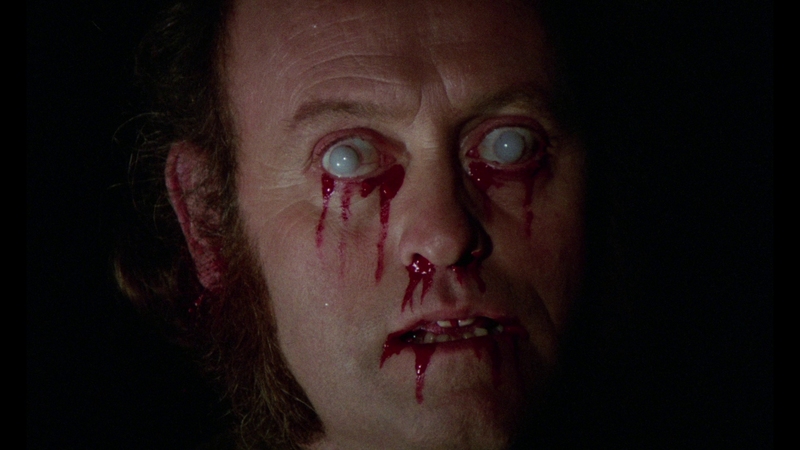 It’s every bit a Hammer horror entry – without any involvement from that British studio. It has Hammer’s brashness, their gore, and upsetting tonalities. 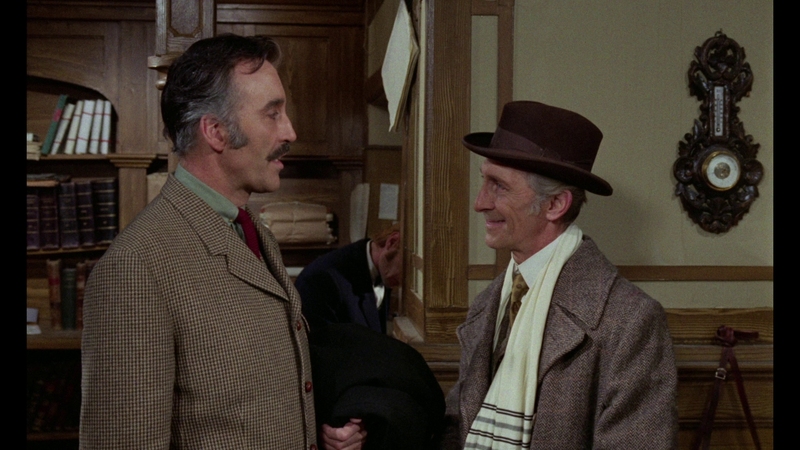 Critically, it features Christopher Lee and Peter Cushing too. And again like Hammer, it’s an update of the Universal monster cycle, anti-science (but with a vicious tone) that sees a millions-year old creature brought to life by arrogant scientific tinkering.Brought onboard a train, the red-eyed being mauls passengers while science cannot come to grips with the unknown. Horror Express isn’t quick to judge though. 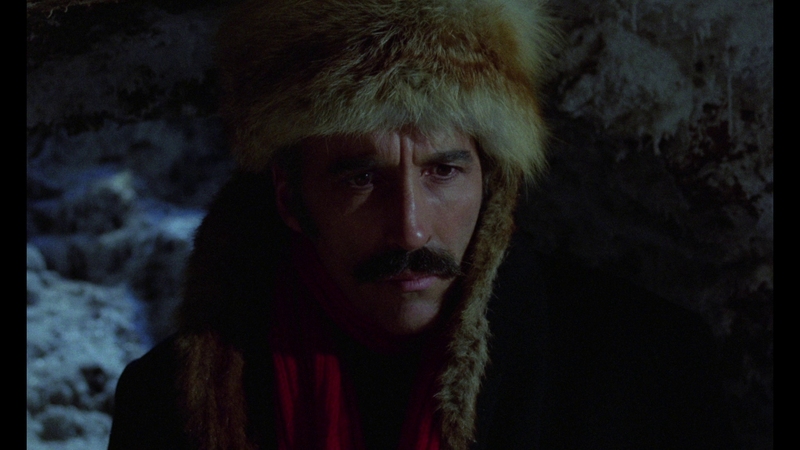 Like the multi-national origin of its creators, Horror Express finds religious devotion equally fallible. A fervently passionate believer, a monk is stuck on a vehicle full of the pompous rich, greedy thieves, and immoral scientists. He’s surrounded by evil, the least of which – to him – is the resurrected monster. The script becomes an angry stare down. Which is less unprincipled – knowledge-bound investigation or the spiritual? It’s a perfect question for the early ‘70s, a decade turning from the contentious ‘60s where the American value system became caught in the trail of Vietnam, racial suppression, assassinations, and the progress of space exploration. 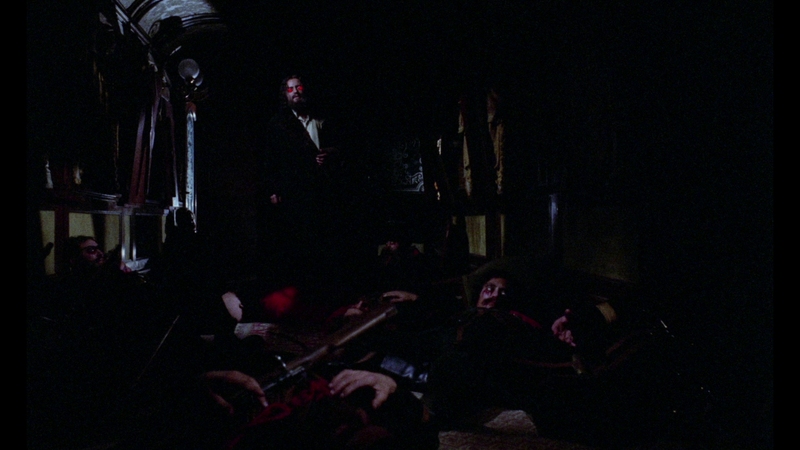 Horror Express invokes all of it to some degree. And, it does so in the smallest confines for a cast this size. An eerie four note theme is whistled throughout, part western, part sorrowful romance, part horror. Again, Horror Express tosses these elements into a story stew. Cushing and Lee carry this material, forced together by a cavalcade of small bit parts making up the curious, eventually panicked passengers. Together, they form a base of rational thought, where the rest appear unglued. 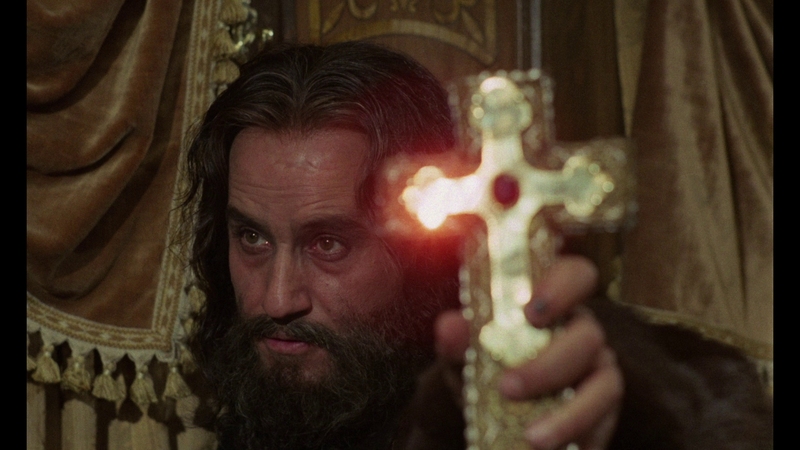 Alberto de Mendoza’s turn as Father Pujardov is especially rich and wild. He spews scripture and prayer, trying to escape from the on-board monster when holding a cross. By the third-act, it’s mashed into chaos. The international travelers begin to mentally break. Bits of comedy lighten mood (“Monster? We’re British you know!” spouts Cushing, insulted by the insinuation his nation is ever imperfect). Telly Savalas enters this fracas, a total screen takeover, and the innovative, mind-eating creature squeezes out a wild bodycount. 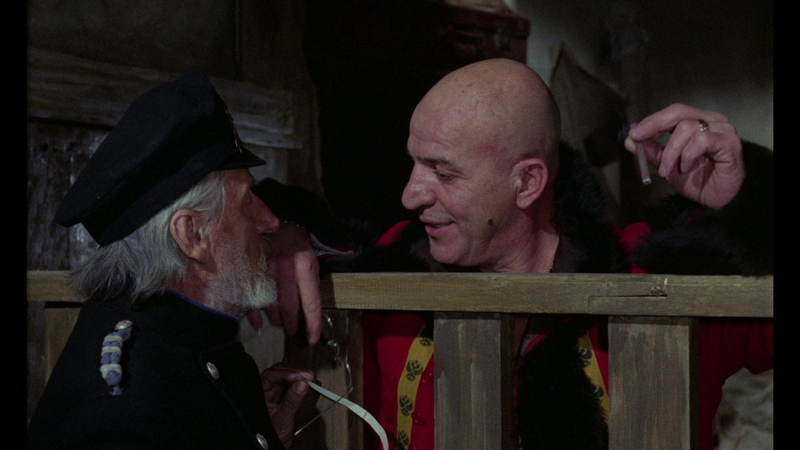 Savalas is having none of it, taking to his weapons rather than research to put an end to this surreal happening. 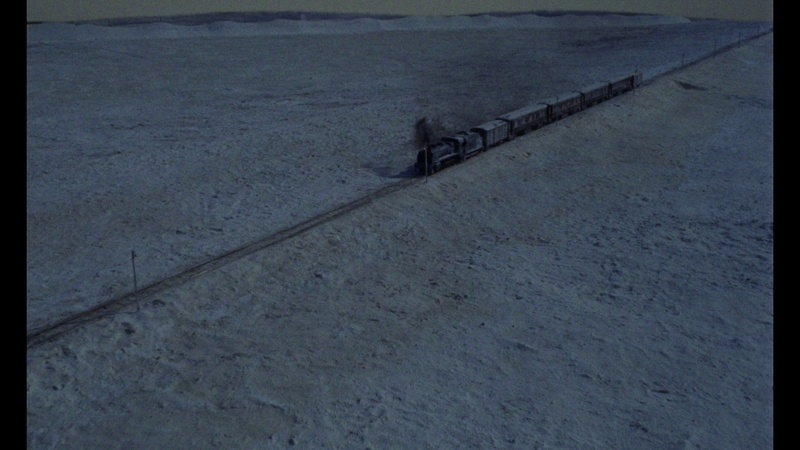 That’s where Horror Express ends. Religion and science merge as well as oil and water. Neither matters. Both, it turns out, can readily be exploited by evil. Horror Express gives no empathy. Considering the ‘50s cinema’s notable Christian slant and the ‘60s dissent, Horror Express brings the ‘70s in with the most Earth-bound solution to ignorance: A loaded rifle. How violent. But, wildly seductive pulp entertainment. Flush with bright and natural color, Horror Express stands out immediately. Dazzling primaries give vibrancy to costumes. They make Horror Express look richer than it ever was. Train décor is loaded with gold trim and beautiful stained wood. To give genre elements a boost, reds pop from recessed glowing eyes and blood. The scan keeps grain naturally intact. Encoding doesn’t endure any hiccups, consistent in resolving the source grit. Behind this all, facial definition remains tight and defined. 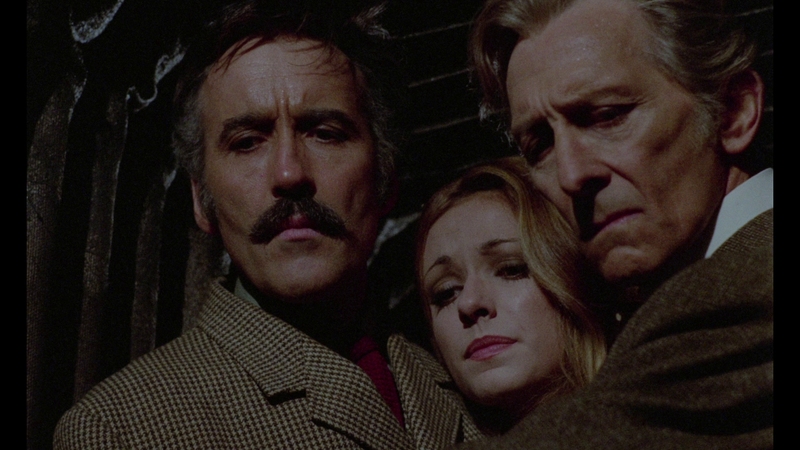 Horror Express’ textural pieces fall into place without harm. Aside from limited gate weave (only near the beginning) and minor scratches, the print is in exquisite condition. Any evidence of fading is squashed. 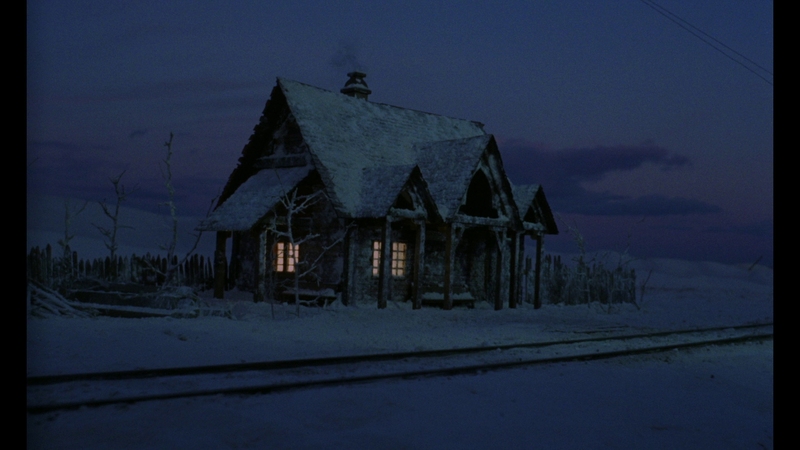 Horror Express pushes brightness from the outset, and the gloomier setpieces test the limits of black levels. It works, resulting in a deep, contrasting presentation. Whistling highs challenge the mix. There’s audible distortion at the peaks. Uncompressed or not (this is presented in PCM), that doesn’t help. Distortion impacts the audio through to the finish. Take the dialog, muffled and rough. 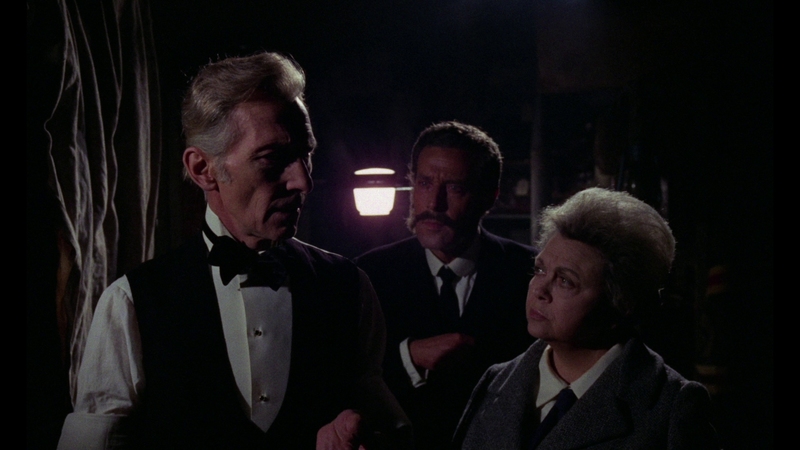 A lot of Horror Express was dubbed over in post, but neither the lines captured on-set or those in a studio sound great. This goes a touch beyond general age. Horror Express is enduring decomposition. Critic Kim Newman and editor Steven Jones provide an enthusiastic commentary, the first of many great extras. Ticket to Die spends eight minutes with filmmaker Steve Haberman as he discusses the film from his perspective. Ted Newsom talks about his producing friend Bernard Gordon, spending 15-minutes on Gordon’s career, blacklisting, and life. An older interview with director Eugenio Martin runs 14-minutes, insightful and interesting. In an interview from 2005, Bernard Gordon discusses his own career for a half-hour. Telly and Me chats with composer John Cacavacs for eight minutes, while super fan Chris Alexander introduces the film in a fun six minute intro to the feature. A mash-up of genres, Horror Express came into the ’70s with unchecked anger and works as a furious story of science and religion. The 15 unaltered images below represent the Blu-ray. 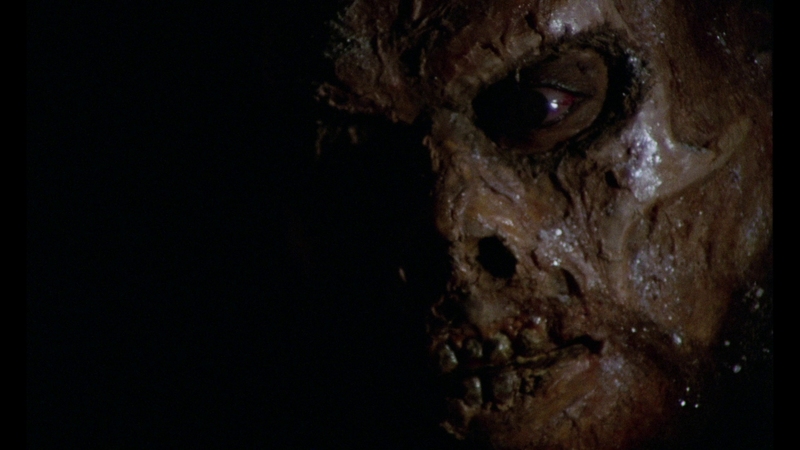 For an additional 26 Horror Express screenshots, early access to all screens (plus the 20,000+ already in our library), 60+ exclusive 4K UHD reviews, and more, support us on Patreon.